In this paper, a routing protocol which utilizes the characteristics of Bluetooth technology is proposed for Bluetooth-based mobile ad hoc networks. The routing tables are maintained in the master devices and the routing zone radius for each table is adjusted dynamically by using evolving fuzzy neural networks. Observing there exists some useless routing packets which are helpless to build the routing path and increase the network loads in the existing ad hoc routing protocols, we selectively use multiple unicasts or one broadcast when the destination device is out of the routing zone radius coverage of the routing table. The simulation results show that the dynamic adjustment of the routing table size in each master device results in much less reply time of routing request, fewer request packets and useless packets compared with two representative protocols, Zone Routing Protocol and Dynamic Source Routing. A Mobile Ad Hoc Network (MANET) does not have fixed infrastructure. All devices in a MANET need to participate in routing and forwarding since there is no access point (AP), base station, or router in a MANET. When a source device wants to communicate with a destination device, it has to build a routing path between the source and the destination. The design of ad hoc network routing protocol is influenced by node mobility, available bandwidth, and transmission power. Bluetooth is mainly pictured as a cheap technology enabling peer-to-peer communication between a central terminal and peripheral devices. The characteristics of low-power consumption and high security make Bluetooth a good choice for a MANET deployment. There exist some differences between Bluetooth-based mobile ad hoc networks and traditional ad hoc networks. Firstly, the connection range is smaller in a Bluetooth MANET due to the low power of a Bluetooth device. 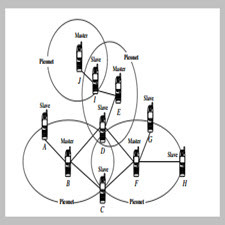 Secondly, the number of neighboring nodes for a device is limited since the piconet scenario in a Bluetooth-based ad hoc network consists of one master device and up to seven slave devices each. Thirdly, a large routing table is inappropriate in most Bluetooth devices due to their limited storage spaces. Fourthly, it is common that a moving Bluetooth device is out of connection with the joined piconet since communication range is short in a Bluetooth MANET. زبان برنامه نویسی جاوا یک زبان چند سکویی می باشد که دارای قدرت بسیار بالایی می باشد و به صورت متن باز ارایه شده است.